I hope that everyone is having a fantastic day today. We finished up a few things this weekend and there will be posts with finished products to come! 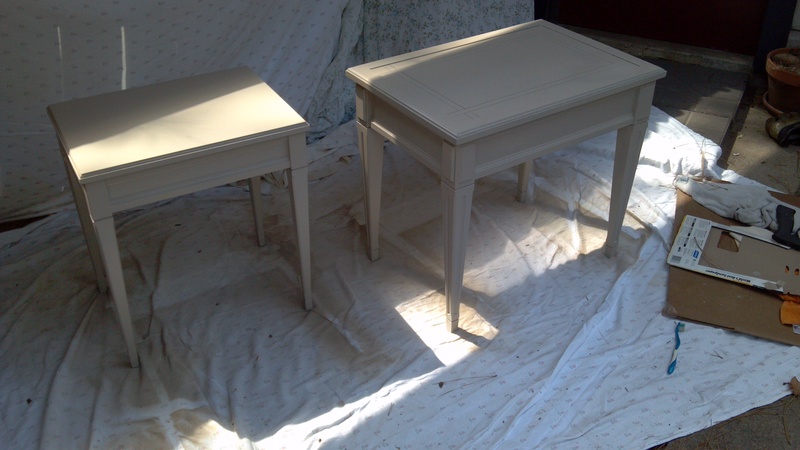 Today I want to show you my nesting tables. 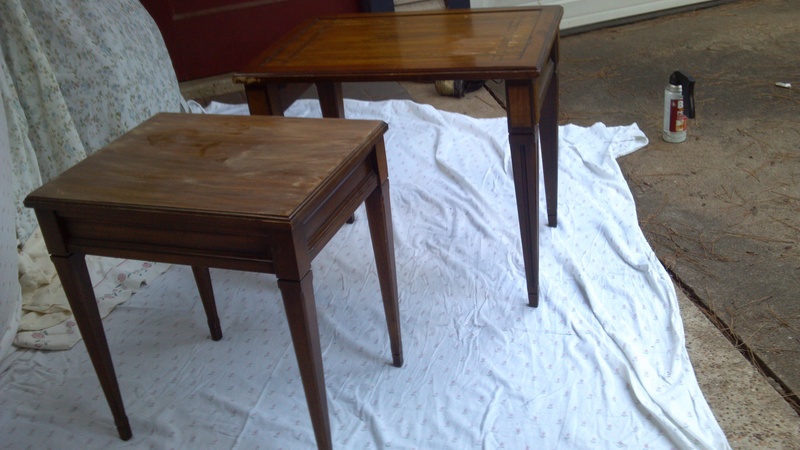 I picked these tables up during the annual garage sale for my parent’s neighborhood for $35. I walked by the booth where these little beauties were being sold twice before convincing myself to get them. I immediately loved the bones of these pieces. They have great lines and I simply love their legs! 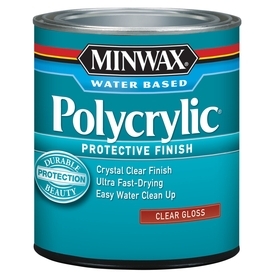 I am not the type of designer who automatically says, “Paint it!” every time that I see a piece of furniture. 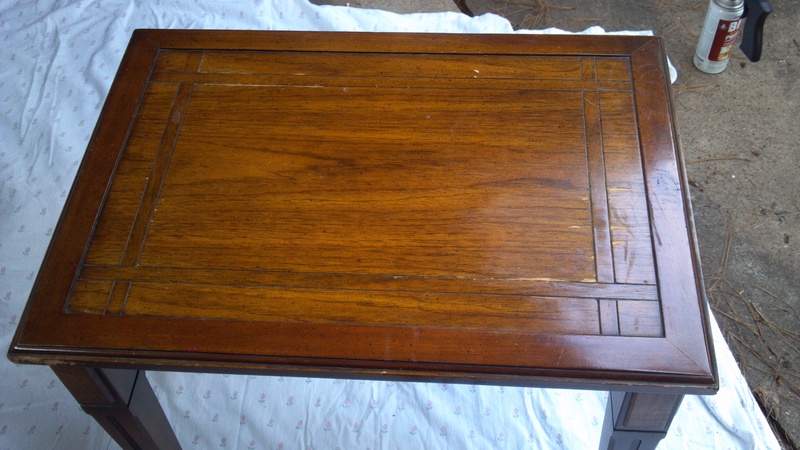 If these tables had been solid wood, I would have done the standard sand/stain/poly. However they are merely a mid quality wood with a damaged and worn veneer. You can see in the photo below where some of the veneer on the top had already started to separate and chip off. So I decided to paint them. 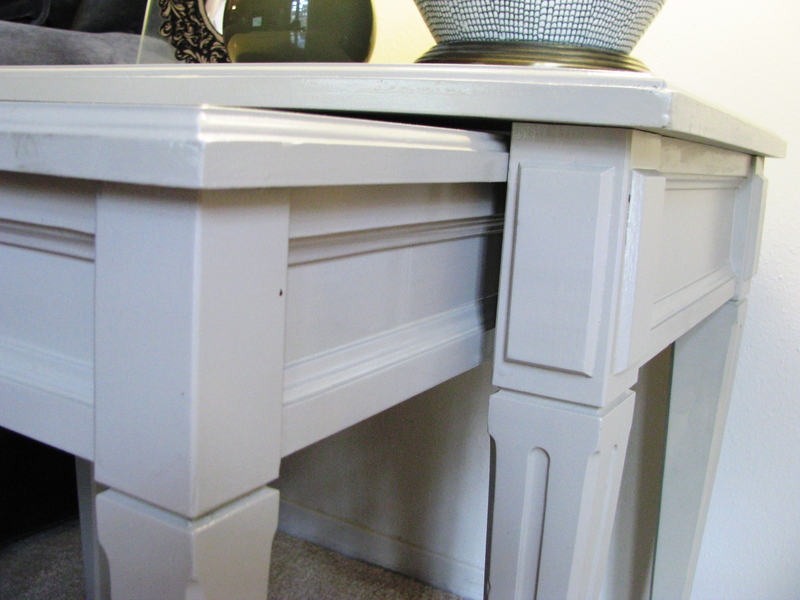 The first thing to do when painting a piece will be to sand the old finish and prep with primer. In this case, I did some extra sanding where the veneer was cracking so that it was less noticeable. Then it was priming time. 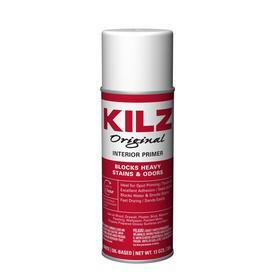 I like to use Kilz spray primer. Kilz is a great product and is very affordable. After priming, I did a light sanding and started with the spray paint. 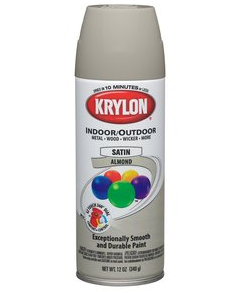 I chose this color, Satin Almond by Krylon. 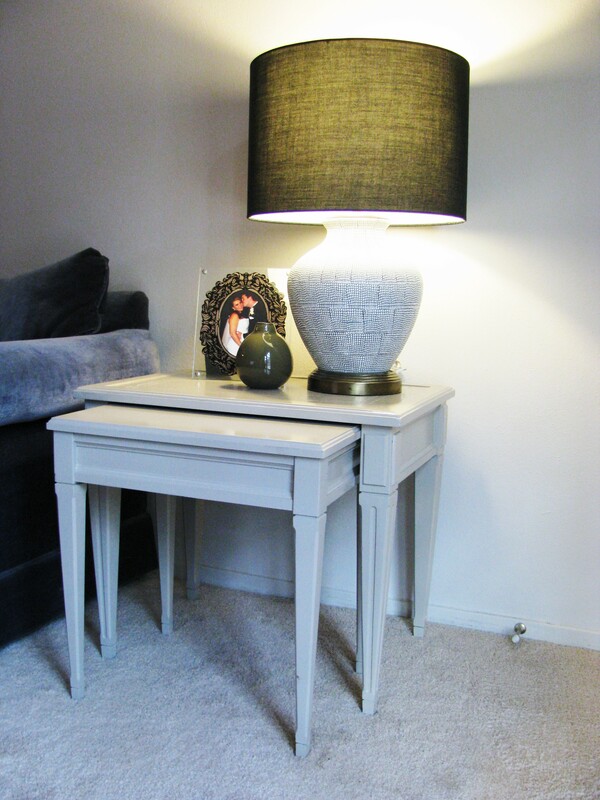 I like that it is a nice greige neutral. Then I coated it with Polycrylic to protect the finish. I knew that I would be using these as end tables… think cup rings… definitely needed to be protected! I should probably add that this silly set of nesting tables took several weeks for me to complete. Why? Well, there was just no way that I could refinish them in the tiny one-car carport at our old place. Instead, I resorted to only working on them when I was able to visit my parent’s house and borrow their garage/driveway. Even though it was a long and drawn out process, I love the end result! PS: Thanks Mom and Dad for being so gracious! Yes, that adorable couple in the photo is my hubby and I. 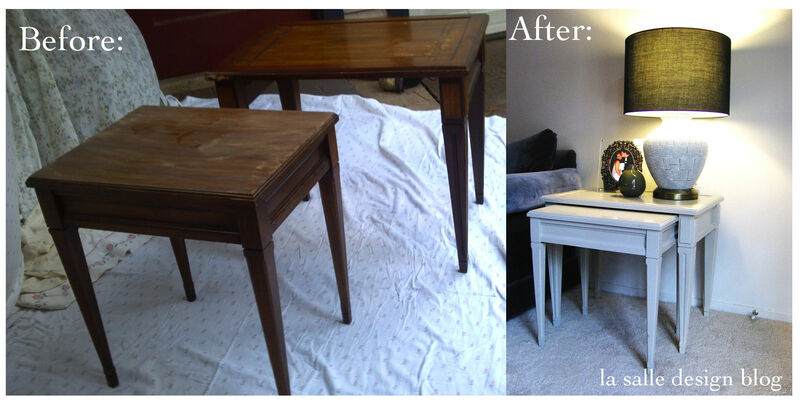 There are tons of fabulous resources on how to paint furniture all over the blog-o-sphere and pinterest. 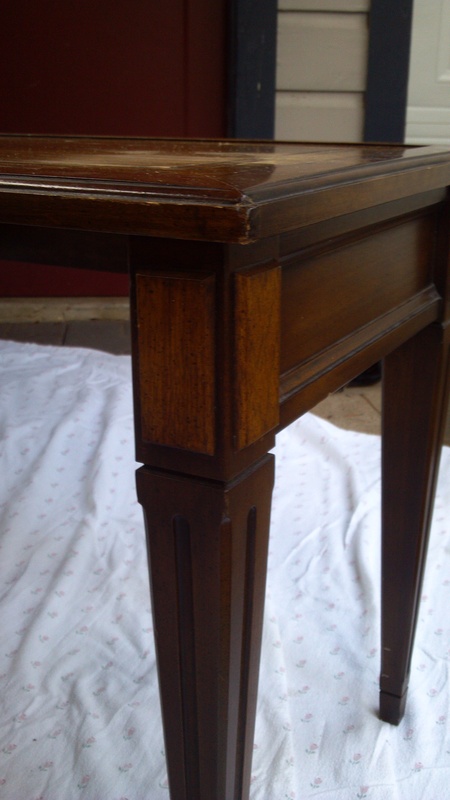 However, I find that the best tool when redoing a piece of furniture, is confidence. Find something that you like or that inspires you. Be creative and when you decide how to make it your own, do it with a confident hand! 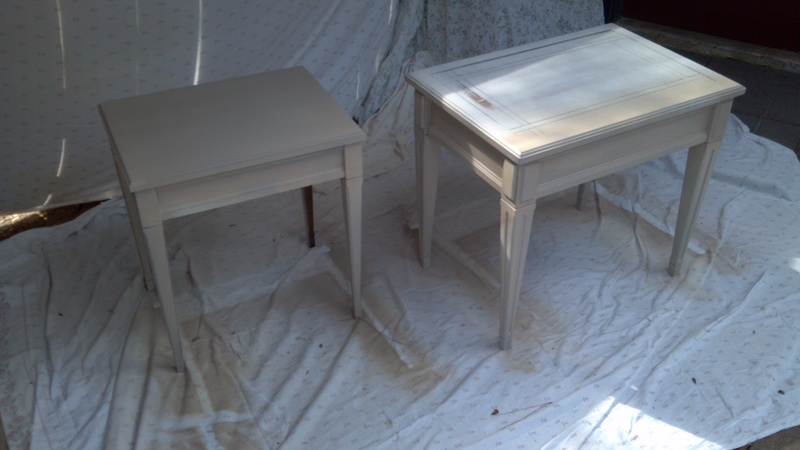 That is all for today… Have you refinished anything lately? These turned out very nice. Good job! Thanks, Adrienne. Hope that you are doing well!